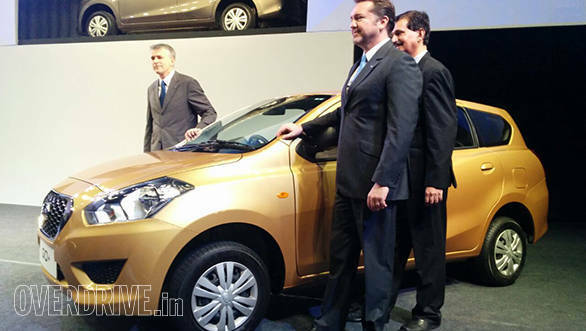 Datsun has launched its MPV, the Go+, with prices starting at Rs 3.79 lakh, ex-Delhi, going up to Rs 4.61 lakh. Unlike the Go hatchback, the estate car styled Go+ will feature an optional airbag for the driver's side in the top-end variant. Datsun says that it has positioned the car as an affordable, spacious sub-four metre compact family wagon that offers three rows of seats. The last row though is only suitable for children upto ten years according to Datsun. With the third row folded away, the car features 347 litres of luggage room. At the launch, Vincent Cobee, global head of Datsun said, "Datsun Go+ is our second model for India in a span of one year and confirms our commitment to the Indian market. It delivers on our promise of making motoring more accessible and more attractive for Indian customers and helping them realise their dream of car ownership. The Datsun Go+ also opens up a completely new segment of sub-four metre compact family wagons in the country and we are confident that the '+' will certainly add new possibilities to our customers' lives." The car comes with a 1.2 litre, 68PS producing three-cylinder petrol engine with a claimed fuel efficiency of 20.62kmpl. There will be four variants on offer, starting with the base D variant going up to the top T variant that features the same mobile docking station that was seen in the Go hatchback. A D+ variant slots above the D variant in the line-up. The company has also highlighted that its cars have the lowest Total Cost Of Ownership (TCO) when compared to its competitors. The company offers the Go+ with a choice of five colours - red, gold ,white, silver and a shade they call Bronze Grey. The standard warranty is for two years and unlimited kilometres with an option to extend it for another two years with unlimited mileage.